I have a simple golden rule for enjoying albums and one when it is broken, will cloud my judgement quite badly when enjoying a new release. I hate it, really hate it, when an album front loads, when the first track is the big single. It makes me wonder whether the band or act really cares about making an album, or whether they should just have stuck to releasing singles on download. It makes me wonder if, creatively, they are up to the job of putting 10 or 11 songs together. I find it lazy, i find it annoying and i find it prejudicial to my enjoyment of an album. 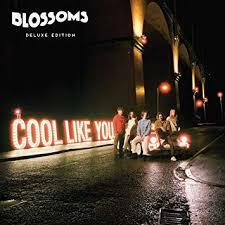 Unfortunately Blossoms, with their album, Cool Like You, have not only front loaded with the first track, There’s A Reason Why, being one of their singles, but they’ve compounded it by putting another single, I Can’t Stand It, as the second track. And I’m afraid, for me, it put me in a mood where the rest of the album needed to be spectacular to make up for this; however unfortunately it falls short. That’s not to say that the music is bad, its just that after an opening bosh of two very fine, radio friendly (and played deservedly regularly) bits of pretty good pop, the rest of the album just tails off, if not into mediocrity, into background music. If it was on the stereo when I was cooking, or writing or reading it wouldn’t worry me. It’s just I wouldn’t pick it out of its place in my CD collection to listen to specifically; I’m guessing its going to stay in that place like the last Coldplay album, and not see too much light again. It’s a shame, as it is obvious that the band can create pretty good music. Was it them who made the decision to load in this way – probably not. Where they maybe rushed to put out an album to build on the success of the singles – quite possibly. In which case, somebody at the record company needs to have a think about their next album. Let them take their time making the songs they obviously can. Structure the track listing so there are peaks to look forward to through out the work. And perhaps the next Blossoms album will be the work they can and should make; Cool Like You isn’t that.